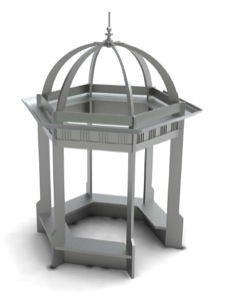 As a long term capital project, the trustees have submitted and received planning approval to replace the former Temple of Mercury, once sited above the amphitheatre, and the Loggia, behind the pond, with contemporary structures which aim to combine defining features of the former elegant structures with modern design and materials. Architects Relph Ross have designed the proposed structures, which received strong endorsement from Downton residents as part of a consultation in 2014. 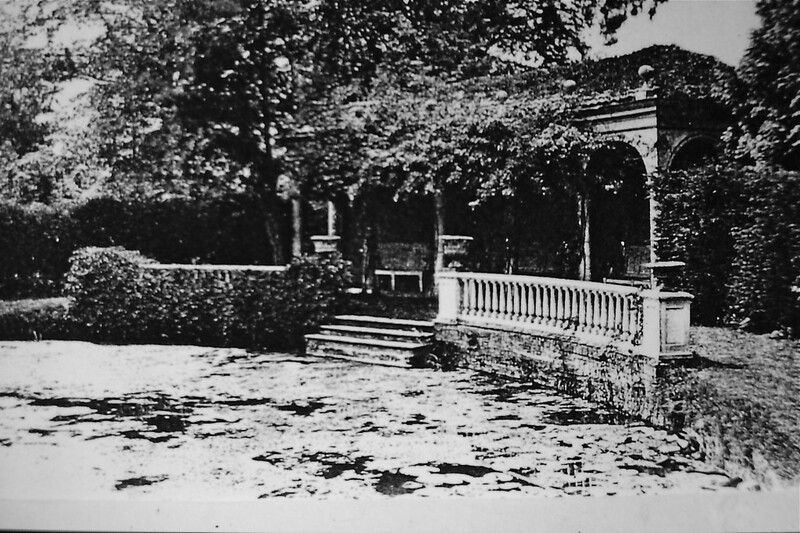 The Victorian Loggia building (pictured left) was built in 1897, replacing a Gothic shelter most likely to have been built in the 17th Century. The Loggia formed the backdrop to the trilobite pond and faced towards the site of the Temple of Mercury. 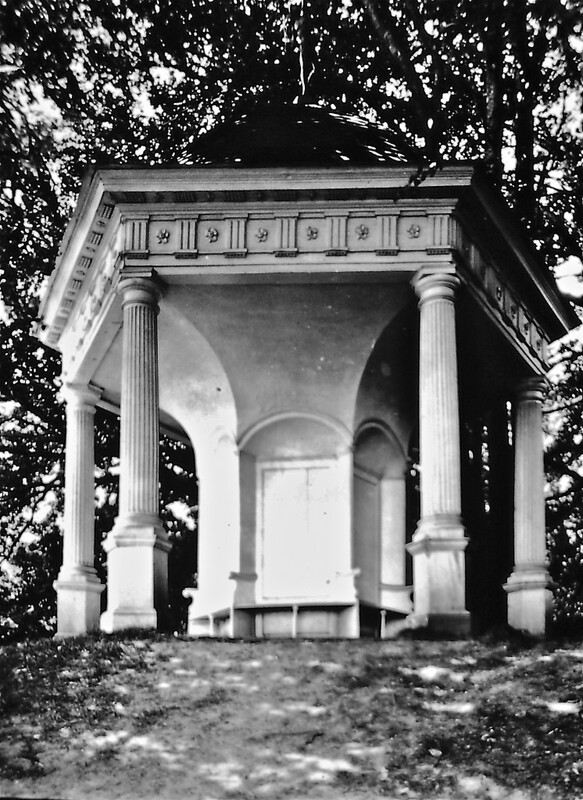 The Loggia can be directly observed from the Temple of Mercury and visa versa. A bold new form to act as a strong focal point from the amphitheatre terraces and ‘The Temple’. Located on restored Pebble and Knuckle-bone floor of the former structure. 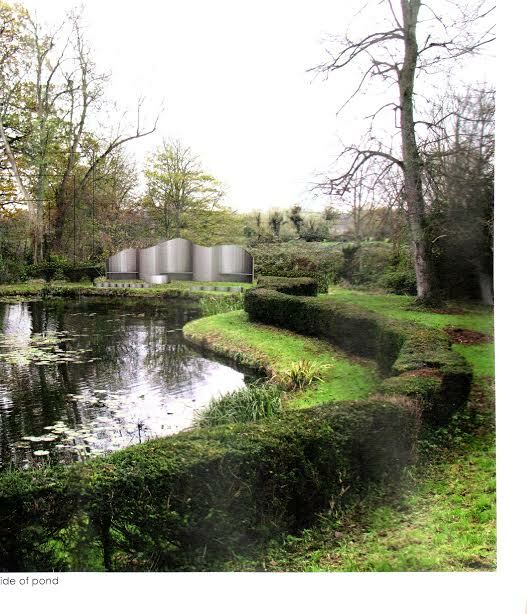 A sinuous stainless steel screen to echo the plan of the tri-lobate pond. The elevational profile reflects the form of the pond. The screen will be ‘shot peened’ to resist vandalism/graffiti and will feature interpretative text. Designed to be approached laterally between clipped yew hedges thus retaining an element of surprise for visitors. Retains ‘Historic Logic’ of the original 3-bay Gothic Temple and later 5-bay Victorian ‘Loggia’ (The Temple of the Muses). Complimentary wave-form metal balustrading at low level and a central raised dais to act as a focal point for the central concave bay. The Landscaping and the planting of hedges will restore the landscape to its original form. Positioned on either side of the Loggia, the hedges will guide visitors along screened paths allowing an element of surprise when the ‘Loggia’ is reached. The original Temple of Mercury (pictured left) is thought to have been added to the Moot Gardens in the late 18th Century. The hexagonal shape of the temple was created to maximise the views from its position as a high point (50.3m above sea level) within the gardens, with one key view across the River Avon. Whilst being respectful of the past the proposal is a contemporary re-interpretation of the former structure, retaining its elegant classical proportions and its all-important geometry in relation to the site. Located on the footprint of the original site allowing for both a celebration of the views out and the option for occupants to sit inward facing. Entry point to the seat is in line with the existing path from the Lime tree walk. Historic Pebble and Knuckle-bone pavement re-laid. I have a photo of myself and a friend taken when I was about 9 years old, c1951, sat by the Loggia. My maternal ancestors are from Downton (Brimble and Eastman families), and my Aunt took us to explore one day and we managed to get into the grounds through a hole in a hedge. I was told that the Loggia was the old Moot and an ancient meeting place. I do hope it is not replaced by that modern metal monstrosity! How wonderful to hear of the Brimble and Eastman family secret forays into the Moot in the 50s. The trustees have always hoped to replace the loggia and temple following the decay and vandalism in the 80s but had to be mindful of future damage in a public and unprotected space. Plans for a replacement design for the loggia were put on display in the village and comments taken. The featured design did provoke a lively reaction but the majority were in support, bearing in mind the design constraints of any unprotected structure in this location. There were those like you that did not like it, and trustees accept that a design is unlikely to be liked by everyone. The charming Loggia in your photo was put up in about 1890 and replaced a gothic one which was the original, and which our new design reflected. I wonder if everyone was happy when the old one was replaced! I would love to see a copy of your family photograph if you can send it in (downtonmoot@gmail.com).